I’ve realized many things in the seven months since we’ve left America and took to the life on the road. This blog has been pretty focused on telling you about what these learnings and realizations have been; but what are we doing, day to day? How are we doing what we do? I’ve had hard time answering these questions, as well as knowing exactly what is being asked by them. Then, it occurred to me a while back: how about just telling you exactly how our days are like? Would that make some things clearer to you? 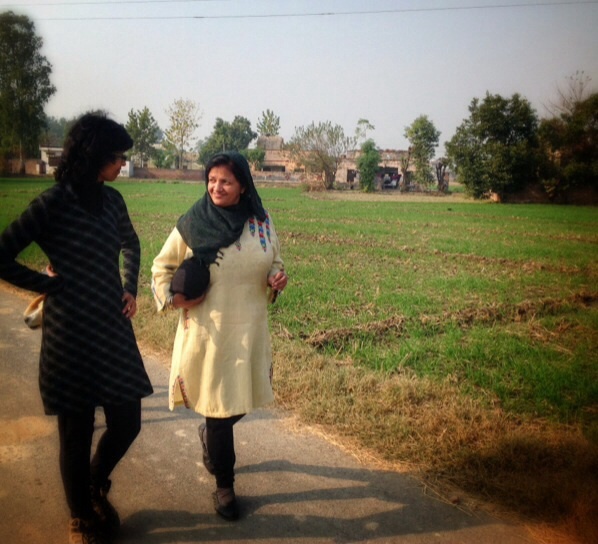 So, the following is a blow-by-blow account of what our lives were like in Preetnagar, Punjab. Enjoy! We get up around 7. Here at Preet Lari house, the breakfast is around 9:30 or even 10 (and as it slowly dawns on me, this is normal in this part of India), so we have a bit of time. Mornings are important time for us to get our writings done, so one of us will go for a morning walk with Kush while the other works on our iPad. That’s usually Dipika doing the work lately, since one of the big reasons we are here is for her to work on her book and other related work over at Kismuth. Every once in a while, I wake up before all this, around 5:30, to do some yoga or meditation, and to write for a few hours. Usually, the house helper, Nupal is her name, brings first chai of the day as soon as she spots one of us up and about. It’s one of the greatest perks of being here; who needs cafes when you have chai service three times a day? The breakfast is either paratha (stuffed Indian bread), served with some achar (pickles) and dahi (yogurt), anda (egg) toast, or chapati (plain bread—the main staple here) with sabji (prepared vegetables). We’ve had millet and rice porridge a few times, too. This is accompanied with our second helping of chai. 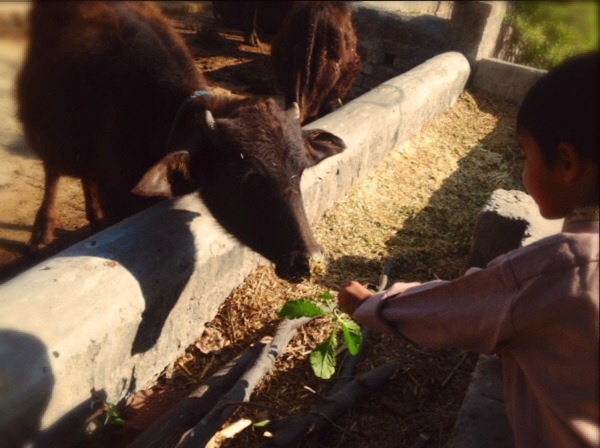 After breakfast, Kush and I invent activities together—it could be doing the chores, like sweeping and tidying up our room, doing the laundry, or watching other people: working on the fields, walking and feeding their buffaloes, or doing the yard work around the house. Our work with Preet Lari, an 80-year-old Punjabi-language magazine and a cultural hub, has been a slow, patience-testing process. We make time to talk to each other, when we can, usually during our mornings. Each of us in this house, our hosts/clients included, are doing a lot of thinking, listening, and practicing giving spaces to each other. The intention is that we help the magazine, and the community it’s based in, grow and flourish. It is an experiment, getting-to-know-each-other session, and let a long-term commitment to each other slowly emerge and grow, if it does. I feel that we are getting there now. It will be some time yet for us to see the fruits of what we are doing together now—we have just prepared our soil, and sown the seeds, so to speak. That seems to be a good metaphor for all that we are doing these days at Orangutan Swing. After lunch, usually it’s quiet time for me and Kush. We might read a story or two, and play some cards, but the main agenda is to be quiet, and take a rest. He has stopped napping regularly now, so this is more of a challenge these days, but everyone needs a down time. Sometimes during these periods, I ruminate on things like what I might talk about in my next emails, or where it’s all going in general for us. There’s another chai time somewhere in there, too. It’s a chance for Dipika and I to have a moment together, and download whatever is in our minds. 5-7pm is my designated office hours these days. I catch up on my emails, write some more, and work on whatever I’m supposed to be working on (these days, it’s our e-course followup to STEER). Our 12-year-old neighbor Luvraj usually comes over after his homework. “Let’s play badmington today.” “Let us play cards—Go fish or Bluff? Oh! Another match of Speed, shall we?” Other times, we just chat, or share our discoveries on our iPads. If we talk to someone in the US, it generally happens around these evening hours, while the kids play with each other. Dinner is usually at 9 or 9:30. Usually, by then, we are exhausted. We quickly eat, brush our teeth, and get in bed for a story, books, or if it strikes fancy of any of us, a mini improv session (two of us make something up, the last one plays the audience). By the time Kush’s eyes are closed and we hear that music of his regular breathing, it’s close to 11pm. One of us’d be asleep by then, too. Right now, our schedule is pretty stable. In other places, sometimes, that wasn’t the case. But between these daily activities, there’s always a lot of worrying and talking about the next steps, money, and what other people think of us. We are slowly getting better handles on these anxiety triggers, and focusing on our work. I’ll leave this post with a quote from Alexander Graham Bell, just in case you need a reminder, as we do!